APRIL 2005: New songs and this year's instant classics. Chris Tomlin, Matt Redman, Charlie Hall and the David Crowder Band lead 11,000 uni students in declaring God's glory! A truly passionate live album recorded at Passion '05, Nashville. 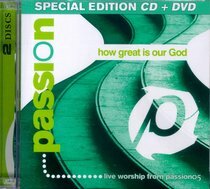 About "Passion: How Great is Our God (Special Edition Cd/dvd)"